A Conversational UI (Conversational User Interface) takes human-machine interaction to a new level. Or better said: it leads to a paradigm shift. Because where people used to have to adapt to computers, computers now adapt to people. A conversation interface allows people to simply talk to the computer and say what they should do. So it is no longer necessary to click on symbols and fill out long forms. A simple spoken conversation or a text input leads to the desired goal. 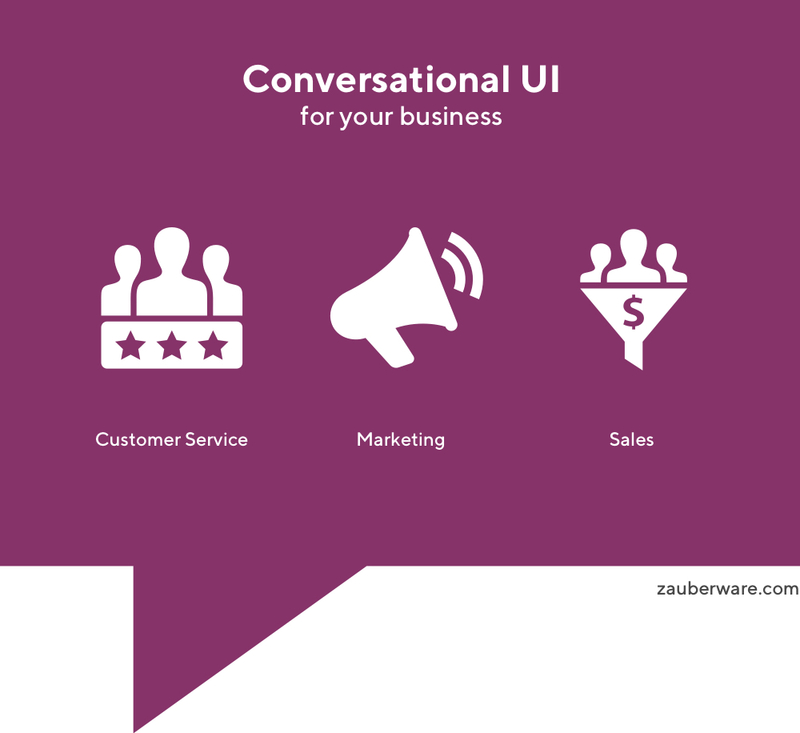 Conversational UI can be used in many ways: digital assistants for your home, car or as financial assistant in an app, improved voice control for apps, chatbots on websites and online shops, first contact in support hotlines, etc. Almost all of these apps are supported by services that use machine learning. Since their first appearance in 2015, these services have improved steadily and a large number of companies and services have emerged around the topic. Another big advantage is a Conversational UI in accessibility. From now on, you can interact with apps on a text or speech basis without having any technical skills. Many applications do not even require a screen (see Amazon Alexa, Google Home). The interface between human and computer has made some leaps since the beginning of the first computer. While the control of the first computers from 1900 onwards was still carried out with self-punched cards, since the mid-sixties it has been possible to communicate with the computer via a terminal with a keyboard. Interestingly enough, the way the terminal works has not changed much since then and is still used and loved by developers. The next leap was in 1984 with the Macintosh computer from Apple and the breakthrough with Windows 3.1 in 1992. They released the first computers with a graphical user interface and a mouse to operate the programs. Apple initiated the next revolution with the launch of the first iPhone. Since then we have found tablets and smartphones in all sizes and shapes in stores and no car or alarm clock is produced without a touch screen. The next big step towards human-computer interaction will be the Conversational UI. The successful use of this technology by the large corporations (Google, Amazon, Facebook, Apple, Microsoft) already shows it today. The improvement of speech and text recognition and the growing range of services for the development of entertainment-based interfaces now allows other companies of all kinds worldwide to use these technologies. Why do "the big ones" rely on this technology? When we talk about speech recognition in the context of Conversational UI, we mean more than just translating from language to text. It's all about recognizing the meaning behind the words. Everyone expresses the same need with different words. If the software can understand the meaning, it enables it to react accordingly. Millions are currently being invested in these technologies worldwide, and start-ups that deal with them are being bought up by the "big ones". A Conversational UI is platform-independent. It works just as well for an iPhone as for a Smartwatch or for the washing machine and for many applications not even a screen is needed. Our experience is that people are very enthusiastic about using a really good Conversational UI. By using chatbots, a company can now be reached around the clock on all platforms and answer questions at low cost. If the request exceeds the chat bot, the conversation can be passed on to real people from support. The direct dialogue is the best environment to inspire people e.g. with a lottery or to advertise a service. Based on our experience, a well-done Conversation UI encourages more participation than a normal website or app. Direct sales via Facebook Messenger or Amazon Alexa? With a Conversational UI, these dreams come true and are already reality at large online shops today. The robots are here! Unfortunately not as in science fiction movies with arms and legs, but as virtual assistants in apps or devices or as voice-controlled toasters. Life with computers is finally becoming easy. Never again problems, right? Of course, every new technology has its hurdles. Just as there are many bad products, websites and online services, there will be many bad Conversational UIs. The conception and implementation can be exhausting and requires competences from different areas. The increased use of technology will also have an impact on the labour market. Virtual assistants will take on more and more tasks in the service sector. But of course more and more jobs will be created around the topic of Conversational UI. Since the emergence of technology, we have not only dealt with and worked with it, but have also actively developed it further. What strengthens us is the consistently positive feedback we receive from our customers and the users of our apps and websites for the use of Conversational UIs.